If you have been following along since the beginning of the year, then you know that I have been sharing the earnings each month of 2 sites that I purchased in January. I am going to share the earnings of those 2 sites again for June; however, I'm also going to start morphing these monthly reports into a more general look at how my business is going overall, and not just these 2 sites (which are a very minor part of my business). So, although I won't be sharing my income from my entire business, I still hope you will learn from some of the things that I've learned and small tweaks that I'm making to my own business. In addition, I have 2 rather major updates to share about my business that I will get into in a bit. So, with that, I'll jump right into the income report for the 2 sites I purchased! 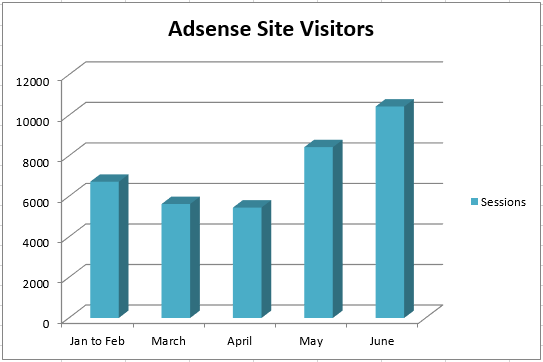 The first site I'll cover is an Adsense based website that is in an electronics product niche. 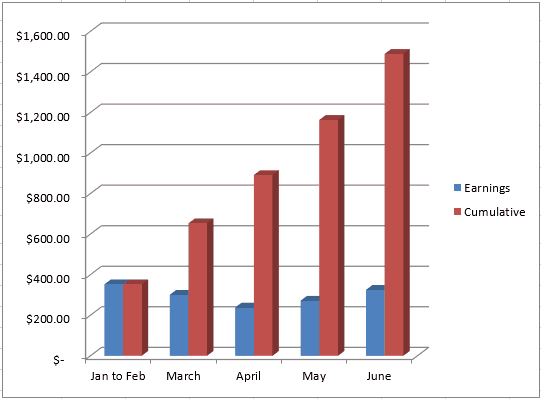 As you can see from the above chart, the number of sessions increased by over 2,000! That is due to the nice rankings increased that I experienced part way through May; these rankings were sustained throughout June. The continued higher traffic levels is what led to the earnings increase. The number of sessions/visitors has a nice trend over the past few months. 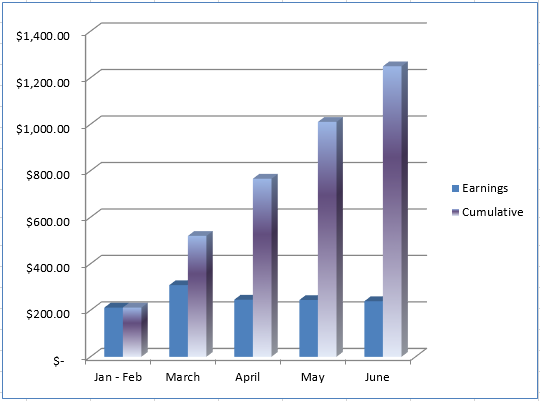 As you can see from the chart above, the earnings have also been increasing for the past 3 months. I didn't do much to the site other than add a couple of articles and tweak the ad layout slightly. However, most of the increased earnings can be directly attributed to the higher traffic levels over previous months due to higher rankings in Google. I don't have any major plans for this site going forward either. I hope to simply maintain or slowly grow the earnings over the next few months. Then I may look to sell the site. In total, the site has earned: $1,489.02. I paid $5,000 for the site. So, I still have a net loss of $3,510.98. However, the site itself could be sold today for nearly $6,500 (based on $325 earnings x 20). This would net me about a $3,000 profit if I sold today. So, I should be able to turn a profit if I just hold onto the site or sell it right away. The second site that I purchased in January, is a site getting most of its traffic from Pinterest, and its in the crafting niche. As you can see the traffic continues to decline; but the earnings are fairly stable. This site has been a nuisance for a couple of months now. The pinterest plugin we have been using has been acting up lately, and we are not able to pin images properly to Pinterest. Both Perrin and I have looked into it, and we know the root cause; but still can't manage to get the plugins to function properly. This site is such a minor part of my business, that it annoys me to spend any more time on it. But I also know that if we can get the Pinterest/Plugin issue fixed; the site will sell for much more…because we should likely be able to increase the traffic for a few months. I discussed in depth the potential to just sell this site in my post last month. I am still considering that. The earnings have been pretty stable over the past few months, but are down just a little bit. I bought this site for $2,100. So, I'm still $850.08 away from turning a profit. But based on $240 in monthly earnings; I could potentially sell this site for 20 times that or $4,800. This would net me a $4,000 profit overall. So, the 2 sites combined that I bought made a total of $564.82. They are also sites that Perrin and I put almost no effort into…we have bigger fish to fry. (Speaking of which, I went deep sea fishing last week and caught some monster Lingcods off the Oregon coast…so I actually do have some big fish that need to be fried). The earnings from those sites is not a big portion of my business, but its been a great learning experience as they were the first sites that I ever bought. One of the lessons learned, is that if the earnings are so low, it still takes a lot of effort to work on a smaller site. So, I made a bigger purchase this time around. About a month and a half ago, I bought a site that earns money from both Amazon and Adsense. The site earned about $2,300 last month. So, its definitely a bigger site and makes it a little more worth my time to tweak the site itself. I'm not going to share how much I paid; but it was well under 20 times monthly earnings. (And the earnings from June were a nice increase from where I bought it at). The strategy for this site is not revolutionary. I just plan to add 10 to 15 articles per month, and Perrin and I will do some minor link building. That's about it. I may look to purchase one more site this year, so if you are looking to sell a site making at least $1,500/month or so, please contact me here. Perrin and I like to discuss strategy quite a bit. Over the past 7 months, we have built close to a dozen niche sites together, and I've purchased 3 sites (discussed above). We are seeing some nice success; but its a slow process getting sites ranked in Google. It often takes 4 to 6 months to see much traffic from a new site, as discussed in my last interview with Hayden Miyamoto. As a result, some of the sites we built early in the year are starting to take off; but the ones we built a couple months ago are still not doing much. In addition to the time it takes to rank a new site; its more difficult to rank a site than in years past. No longer are EMDs helpful in ranking quickly, or getting just a few links. Sites need to have lots of authority in order to start ranking for lots of long tail keywords; which really is a change from a couple of years ago. So, Perrin and I have decided rather than spreading our effort between 10 sites; why not focus on one bigger project that has much higher earning potential? The niche sites we built are more laser focused, and might have an average earning potential of $500 to $1,000 each if we get them all to the top of Google. (Some could certainly do more than that, but not all). However, for the amount of links we are building, content we are producing, and time spent; we could be focusing on one larger project that has much more than the combined averages of all those sites. As a result, Perrin and I are building one new authority site that we expect to grow into something much larger than just a few thousand dollars a month. I'm not going to go into too many more details, as this project is in its very early stages. We just bought the domain and have developed an overall strategy. To give you an idea of the size of this project; we will be adding one long keyword based article per day, and 2 or 3 short news based articles per day. So, with 3 to 4 new pieces of content per day; you can start to get a feel for the ambitions of our project. So, clearly we've chosen a niche that we can go a bit broader in for subject matter. However, each keyword based article will target longer tailed keywords that get anywhere from 200 to 1500 searches per month for the most part. In addition, we plan to diversify our traffic sources much more than we would on a small site. Usually, we have focused exclusively on Google. Now we hope to gain traffic from as many sources as possible; such as Google/Yahoo News, social media, kindle ebooks, referrals, email marketing, and more. In addition, our revenue will be more diversified. We may start with some Adsense or CPA offers; but eventually we plan to create our own products, books, and possibly some type of membership area. What about link building? We plan to implement much more “white hat” link building into our repertoire. Because this is a long term project that we plan to spend hours on each day; we can take the time to reach out to real influencers or discover other creative ways to get noticed and generate links. Sure, we may build some links that are low hanging such as PBNs, blog comments, or other…but this will not be the focus and will likely be a very small percentage of our overall links. Our focus will be on building longer term links such as contacting media outlets and building contacts with larger sites or bloggers. (We have a much more in-depth strategy with lots of possible links sources already that perhaps I will dive into in another post). This project may take a year or more before we see the real returns. But after that time, we hope to be earning much more with this one site than we could earn with a dozen smaller niche sites combined. I don't know how much I will be sharing in regards to this new authority project going forward. However, I did want to mention it as we plan on it being a major part of our time and business over the next year or so. This also represents what I have been saying for quite some time now about the advantages of larger sites over smaller sites. 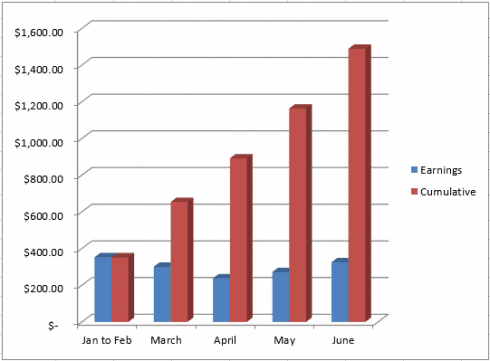 Google rewards authority, and as a result the game has shifted significantly. Small niche sites are a great place to learn, but a better long term business is to build out a larger site that attracts true authority and hopefully profits. Overall, I still want to continue sharing the earnings from the 2 sites that I purchased earlier this year because I made a goal to do so; but as you can see that's not really where my focus is. While I still am looking to buy up another large site or 2; my creation of new sites is coming to a halt. I will now be focusing on growing some of my existing niche sites; and then most of my effort will be placed on the new authority site that I mentioned. As always, I'd love to hear your thoughts and questions. Please feel free to join the discussion by leaving a comment below. Question regarding back links. I am trying to build a larger site and was wondering if back links devalue if I link to multiple pages from the same pbn? Meaning can I use my pbn blog (1 blog) to link to multiple pages on my authority site? I’ve read before about 1 link per domain will count but wasn’t sure. Having more than 1 or 2 links from the same site in your pbn, will indeed get less potent as you add more. One link per domain is fine, as long as they are from different sites/different IPs. Every PBN on the market that sells links offers 2 links per post. I hope for everyone’s sake that 2 links to 2 different pages on a money site from 1 PBN domain does not drastically reduce the link juice. You are misunderstanding what I meant. 2 links to 2 different pages in not reducing link juice; that’s fine. But there is not much added benefit to linking over and over again (on different articles); from site A to site B. (Its less potent, but can still add some value…you will get more value from getting links from different sites). So if site a is the authority site and has article 1 and 2 then linking to both of them from pbn 1 is fine. As long as I dont link to article 1 twice on pbn 1. Wow this is kind of hard to explain lol. It’s good to see that you are shifting your focus to larger sites. My question is, What do you suggest to someone who is just starting out in this niche site business? What type of sites should someone build now? Another question is , how do you validate that this authority site will eventually be a winner? Specially when you are prepared to spend a year worth time and energy, there should be some sort of validation ! Here is what I suggest: https://www.nichepursuits.com/should-i-build-large-or-small-taking-a-portfolio-approach-with-niche-sites/. In a nutshell, use smaller sites to learn/test…but main focus should be on one or two larger sites. well i hope 2 see your new authority blog grow…. i think its better that way… will love to hear your link strategy for this blog. Yes, I’m sure I’ll share more as we implement. I would also love to see how your authority project will go. I also started working on so called AUTHORITY type site but I am not going to build any links in its first year, I am leveraging social media and having good success!! Though its tough to maintain an authority site single handed, its lot of work. Managing content creation, social media etc. Best of luck for your authority project! Great to see you guys going the authority site route. I’m excited to see what you’re coming up with. I agree — the authority site sounds like an exciting project. I think you’re going to enjoy outstanding success with the approach and publishing schedule you mentioned, assuming you can manage to keep it up, and also ensure that the content is all worth reading. Another important consideration would be this: what kind of schedule do you have in mind for maintaining the content in both the short and long-term? In my experience, with authority sites, maintaining the content is at least as important as writing it in the first place. If you’re outsourcing some or all of that content creation through sites like textbroker, you aren’t going to be able to get the original writer to go back and make updates when the original article goes outdated. Have you put a plan in place for that yet? You’re probably not lacking for blog post ideas, but your content maintenance schedule is a topic I’d love to see you write more about if you ever come up short of things to write about. We’ve already hired a full time writer for the site. She posts 2 to 3 articles a day, and we expect that continue long term. That’s great! But is she going to help you maintain the content and keep it up to date? That’s what I’m getting at. In my experience, you need both a schedule for content creation, and a schedule for content maintenance. Associated Content / Yahoo Voices was lacking this, and in my opinion it’s one of the main reasons they failed. Good luck with the authority site building. I’ve been thinking that is the way to go after all the recent google changes. I have been building my niche site into a broader authority site, but I have been having issues determining what the most profitable sections would be to add to the site – how did you guys go about figuring this out? Ideally, you will already have some success with portions of your site…those with more traffic and earnings should get expanded upon. I have been interested in buying a site lately and I love reading the updates on your two sites that you bought. Even though they both seem to be pretty steady on the earnings and they haven’t done as well as you had hoped you will still be able to make some good profits from selling them. Good work Spencer! I had great success applying the techniques you specified for niche amazon sites – excellent keywords research, commercial keywords and products, comparison tables, etc..- to an authoritative “general” site. It’s not a niche site at all, and has no unifying general theme overall. I would have an article about “best survival knifes” right next to an article about “best razor” , right next to an article about “best adjustable dumbbells” to give examples from recent successful niche sites. Works great for me, each article is long and qualitative, and the links i build for each article individually contributes to the general authority of the website. Makes slightly less than 3,000$ per month. Started to earn that amount within 2 months – got lucky since i also caught the december/christmas period. It’s only about 8 months old, and already bought around $15,000. Something to consider. Niche site strategies applied to a more general, authoritative site for the win. Anyway, best of luck Spencer, always inspiring to see your progress and your posts. Hey Ferzy, glad you are finding success! You say, “Something to consider. Niche site strategies applied to a more general, authoritative site for the win.” Well, that’s exactly what we are doing with our authority site…so we are on the same page. We diligently research each keyword, and those get produced as a new article. However, the different between what you are doing and we will be doing is a unifying theme. For example, think of the Finance niche (not ours); you could create thousands of long tail articles in that niche. Your strategy is very common though: About.com, ehow.com, etc. Are long tail Amazon sites in danger? You can only write so much about Safety Razors before you have to turn it into a mini Esquire/GQ. Perrin hasn’t been writing about safetly razors for a long time :). That’s the idea, start small and grow it. It looks like we have similar thoughts on this. I’m building one big authority site as well. Your earning potential from 2 sites is really good. I have become a fan of blogging due to such success stories. But can you guide me on link building strategy for my current site. I honestly believe you are overqualified and over experienced to play around with niche sites and pinterest sites that generates $329.68 a month. Moving onto building authority site that has potential to go viral without the help of search engines is a great idea. Good luck with your projects spencer! I am really grateful to you Spencer.. Big Thanks.. I am planning to sell it …what do you think how much It can fetch me? Also I have found some really cool ways to get likes from good relevant sites ….for which I want to start a PBN service …do you think it is viable? I am new here and it was a wonderful experience to go thru it. Can you please point out your posts that talk about Adsense and Pinterest related Niche sites? How was it done? My thoughts are that you should sell the Pinterest site so you can focus on your other projects. It seems like too much effort is being put it without seeing much results. Hey spencer! I sold a site last month for $2,400 which was great and the site was making $200 – $300 per month. Can you explain how you sell your websites for 20x the monthly earnings? I use flippa to sell my sites. I also sold one last year for $1750 and it was making about $130 per month. Can you explain how to sell sites for 20x the monthly earnings, I can only get about 10 – 15x monthly earnings. I haven’t actually sold any sites on Empire Flippers yet, but when I do sell, it will likely be there. EmpireFlippers.com lists all sites at 20x average monthly earnings. Trying to sell a site for 20x maybe a little tough; it can be about supply and demand; If no one is after your domain, then the demand is not there, and be honest, would you buy a site for 20x? That means you have to sit on the site just short of 2 years and hope you get your money back. 12x-15x sounds about avg and about right. You do not want to be too greedy unless you know for sure you have a hit, if not, then you want to set a realistic price so you can sell it fast…. Always enjoy reading your income reports Spencer. I think it’s a good idea to start focusing on bigger authority sites than small ones with limited room to expand. Sure they take longer but the potential is 100x that of most niche sites in terms of traffic, content, growth and profit. Will be interested to see how things go with it. You’ve certainly got an ambitious content plan lined up. The purchased sites look like a good model. I agree it takes longer to rank a site these days so it is nice to have instant cashflow from a purchased site and make improvements along the way. Best of luck on the big site! thanks for the inspiration for todays post on my blog! Excellent read. Good luck, guys! I have been planning for a larger authority site a last couple of months. Let’s see how your site works! It will help to take the final decision to build one with at least the effort of 10 small niche site! Great to hear that you will be working on an authority site. Not enough people talking about these and long term strategies. If YouTube is part of your strategy don’t hesitate to reach out for help and advice. FOC of course. Awesome…thanks for reaching out! Youtube won’t be our first avenue, but certainly could be down the road. After 7 niche sites of which only 2 are doing “ok” i too want to build a bigger siloid site. I just purchased my long brainstormed domainname and i am currently thinking out my overal strategy. I found several keywords that i can turn into silo-pages with lots of longtails to that keyword for the posts or childpages to those silo-pages. hope im making sense here,… first problem where i cant seem to find an answer to is. lots of simular keywords twice in 1 url might seem like a rather meaningless question to you i dont know but i am unable to find a suiting answer and i dont want to start of such a big project on the wrong foot. hard to change your permalink structure once you’ve got backlinks out there. You can do either for slugs. If you want to avoid the reputation, then change it…but I’ve personally never bothered. Great post. Good ideas. Quick question. How were you able to find a good site and pay under 20x? Do you have a method for checking the site and negotiating the price? I was contacted privately via email from a couple of people looking to sell sites. Another one I bought on Flippa and negotiated the price privately down (the Pinterest site). I’ve still notice more and more EMD that are ranking high and are new “a few months old”. I know the reports have been saying EMD is dead but how do you explain those EMD sites that are ranking quickly? Also, congrats on the new project. I assume you wont share the sites name, but I hope you share the process as much as possible. EMDs can rank just like any other site; but the EMD is not what makes it rank. Focusing on one or two authority sites is a good strategy. Steve Scott is doing something similar in the Personal Development space. Having your revenue streams come from multiple sources is always a good thing. I wish you and Perrin much success with this project. The domain that you bought for your project.. Is it an aged domain or a fresh new one ? Thanks for the post and great insights. Question around the management of your sites and post writing. Do you write the blog posts yourself for your authority (and other smaller) sites or do you outsource this? could you advise us on how you go about outsourcing or writing your posts? Writing a decent length post takes some (a lot for me) of time and I’m wondering how you keep up if you have multiple sites. Its outsourced. Perrin writes some, but we’ve also hired people mostly from our personal network: college acquaintances, previous coworkers, etc. But you can also hire authors off Elance/Odesk as well. I haven’t outsourced in the past, but I just don’t have the time to write content myself, so I may take the plunge. What do you generally pay for a high-quality, outsourced blog post? BTW, Westwood, Mesa, or Mountain View? A thousand word blog post is $15 to $20 usually. Mesa High all the way :)…go jackrabbits! Ok thanks for confirming! I’d also like to outsource but then it’s a question on whether it will be a profitable trade off or not. “the site has earned: $1,489.02. This is actually not taking into account the fact that you pay around $15-$20 per article, right? Should you not be adding your post costs in this calculation to estimate your actual net loss / profit? You are correct on that. I’ve added about 10 articles to the site, so my true loss is $150 to $200 more. One question on the earnings sample at the very top what does it mean when you have the “cumulative” report? Is this data for total earnings this site got? Yes, total earnings since I purchased. Good report. I’m happy to read you’re swinging for the fences with building a huge authority website. I did the same… starting a new site with authority ambition in January 2014 and it was one of the best decisions I’ve ever made. I’m at 600k monthly pageviews and it climbs every week. The revenue is great and overall the entire site is a real pleasure to work on. My goal is one million monthly page views by the end of this year. My traffic sources are many as are revenue sources. I’m able to invest plenty of time into building up social properties which are proving to be great assets on their own. Going big and white hat is the way to go. FYI – I have not built a single back link to this site. I just do my social media efforts, yet the site does receive a good chunk of organic search traffic each day. That’s awesome! Congrats on the success. Feel free to use my contact page and send me some more info; I’d love to chat about your site. Jon, 600K page views per month is amazing! Just wanted to know, how large is this site, i.e. how many pages does it consist of? Hey Jon, how did you pick and validate your niche? Is it a B2C or B2B website? Also, can you tell what revenue sources work best for you? Thanks! I have become a close follower of your blog and it has always been great looking at your growth and strategies; however, I feel now you are drifting away and wont be sharing as much in future. I am about 2 months into the same plan in a huge niche but in a foreign language. As I’m still waiting for google to rank the site I’m seeing that in this language Pinterest has exploded and I’m focusing on it and content right now. I would love to see a blog post on your strategy for this site. Thanks for all of the content and help I would still be just sitting with a parked domain without it. I’m sure we will start doing more posts focusing on this larger site. And we have some great podcast interviews coming up discussing the matter as well. Very interesting indeed, Spencer. Yeah, I agree – you guys have bigger fish to fry (sounds like literally too!) so I’d “stop wasting too much time” and get to a point where you can make a decent profit on the two sites you bought, sell them and re-invest the profits into one or two larger projects as you’ve mentioned. LOVE the strategy! All the best with the new site! Spencer, love to hear you and Perrin are looking to try a bigger site. As I’m still very much a newbie at this, I have a ton to learn just to get a niche site up and earning a couple bucks per month. I can only hope one day I’ll be able to do what you guys are doing, but in the meantime it’s going to be a big help that I can learn from your journey. Spencer, great post, as always. Did the idea for this site come from keyword research, or did you think of the idea and then validate that it had lots and lots of longtails? Also, if you are talking about eventually reaching out to leaders in the niche, and possibly making your own products, is it safe to say that the site will be more than just a collection of articles? Hi Spencer, another great post sharing your progress. I have many EMD niche sites that I built few years ago. It was doing great previously but plummet due to the algo change. However they are pure content site and SEO was done in a decent manner. 1) I am thinking to invest in RankHero and pump some links to those EMD domains. Do you still worthwhile to invest in those EMD ? 2) What’s your experience on Indexing service ? I use it for some new domains I purchased, I see some spike in traffic but I think I can’t continue doing that for long term. 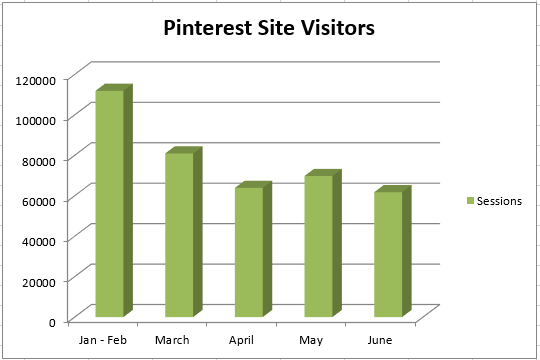 3) What’s the pinterest plugin you are using ? I am trying to find a WP Pinterest plugin that allow me to automatically post to Pinterest from my blog. I think EMDs can work just fine; they just don’t give you an advantage anymore. So, if you think the site has not been penalized, then you should treat it like any other site. As a side project I registered a domain back in 2005 and built a small site on it (about a dozen pages). I was always busy with other stuff, so haven’t done much with it since then. I wonder what Google thinks of this domain/site. I get maybe 20 people a month to the site. If I try to develop the site, does it give me a leg-up since it has been registered and indexed in G for so long, or does it work against me since I haven’t updated the site in probably 7-8 years? I don’t think the old domain will give you that much of an advantage. Its nice, but most of the work comes from other places. Its still up and running and doing better than ever. Do you have a complete list of it? Like for example, youtube, pinterest (social), blogger wordpress tumblr (web2.0) etc. Are they considered weak? Seems as though Hayden is the trailblazer. I think I’ll follow him too. This is another great food for me to eat for tonight. I too had bought one of the site from flippa. But unlike you, I didn’t had much earnings as it was shown to me. Any help if you could do. You mention that making a single authority site is a better strategy than several smaller sites. I have several small sites that are all about a topic and I’m using as a PBN. Would it be a good idea to move these together into a single site? If I do so, and respond with a 301 code or something similar, can I pass the existing SEO juice to this new site? That’s a tough call…not sure. If you are using the sites both as money sites and PBNs, perhaps they are not the best thing to grow? These make a little money off Adsense, but their main purpose is as a PBN to make my money site rank better (and since they are in the same niche, some of the ads I serve on these get users to my money site as well). I have read through you comment about your site you purchase from and you added more quality content into it to increase authority where the content you purchase somewhere around 15$ to 20$ each. Can you recommend the best outsource service that get content from ? Elance, Odesk, or Textbroker.com are good places to get content. I am curious that you are posting 3 to 4 sposts for your larger authority site. Don’t you think google will devalue those posts further. Better will be writing longer quality post and see the benefit google will give to those posts in long term. My point is once google penalize some of your posts, you might never able to rank your authority site for the intended keywords. 1 post a day is going to be very in-depth and quality – 3000+ words. The other 2 or 3 are going to be “news” posts…so still quality, but much shorter. Google doesn’t devalue lots of content, they like it very much (especially when its high quality). Spencer, I found your work through Pat Flynn and I’ve been following for a while now. In my opinion, you’re dropping some of the best SEO advice on the internet, simply because you admit what no longer works and keep your readers informed of the changes in your business model. I recently started a new site 2 months ago and I’ve had very slow progress with Google/SEO, but I’m continuing on the grind, especially with your advice that it simply takes longer to rank now. Thanks for all the help Spencer, love your work. Thanks Rob! I appreciate the kind words…and encouragement to keep sharing successes and failures. I like how things have evolved from “gaming” google with niche sites and PBNs to eventually just becoming totally white hat – essentially what Google wanted in the first place. Google has really done well with their algorithm! Yes they have. Although you can still do well with smaller sites and PBNs…proven by the fact that I still have several doing well. But for longevity, white hat (like google wants) really is the way to go. I’ve got one big site I’m working on right now that’s on an upward slope. However, I’m trying to build a smaller site right now in order to build both up over time. It’s a struggle for sure, especially since I write all the content myself. It’s all white hat, and I’m hoping it’ll pay off in a few years. Start small with the intent to grow it larger. All sites have to start somewhere.